According to Statistics Canada, consumer prices rose an annual rate of 1.5% in 2016. This was to disappointing investors for the second consecutive month as expectations were for an annual inflation rate of 1.7%. According to the December CPI report issued by Statistics Canada, declining food prices weighed on inflation over the year but were offset by sharply higher prices at the pump and marginally higher prices in the other components of the all-items index. Prior to seasonal adjustments, the all-items index slipped 0.2% in December, following a decline of 0.4% in November. The transportation index added a full 1.0% for the month, driven by rising gasoline prices, which were up 3.1% in December. The only other index to increase in December was the shelter index, up 0.1%, following a 0.2% increase in November. Prior to seasonal adjustments, the food index was flat for the month as the cost of food purchased from stores slipped 0.1% and the cost of food purchased from restaurants gained 0.1%. The index for food purchased from restaurants has been moving steadily higher over the past two years. Meanwhile the index for food purchased at the grocery store has been much more volatile and fell sharply in 2016. Statistics Canada’s December CPI report highlights the significant downward trend in food prices. 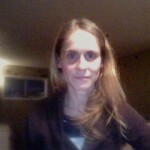 The report cites other prolonged periods of deflation in food prices in Canada. Food prices fell for 8 consecutive months in 1992 and for over 12 consecutive months starting in 1952. Lower commodity prices and a relatively strong dollar are some of the many factors impacting the price of food in recent months. Seasonal adjustments suggest overall prices grew 0.3% in December and slipped 0.1% in November. For the month, seasonally adjusted prices were up in six of the eight major components of the CPI. The food index was unchanged and the index for alcoholic beverages and tobacco products fell 0.1%. On the other hand, seasonally adjusted transportation prices spiked 1.5% in December after falling 0.4% the previous month. 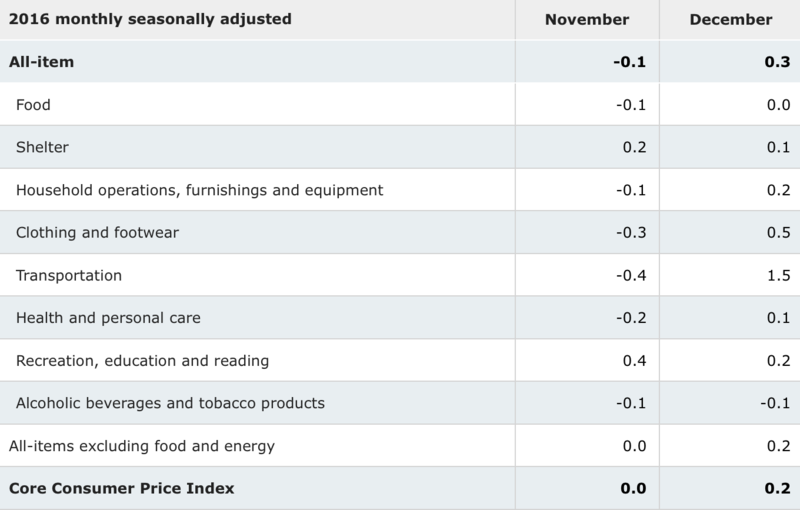 With seasonal adjustments, December’s monthly inflation numbers are slightly stronger than November’s numbers. The consumer price index rose 1.5% over the year ending in December, reflecting higher prices for transportation and shelter balanced by a decline in prices at the grocery store. The food index fell 1.3% in 2016 with grocery store bills reportedly dropping 2.8%. The index for food purchased from restaurants increased by 2.3%. December is the third consecutive month of annual declines in the food index. Year-over-year, the price of gasoline was up 5.5% in December to bolster 3% annual growth in the transportation index. The cost of public transportation also grew by 5% annually in December. In November, the transportation index increased 1.4% and the price of gasoline dipped 1.7%. Gasoline accounts for roughly 3.8% of the all-items index and extreme volatility in its price has been the dominant factor in overall inflation over the past year. Excluding food and energy, inflation was 1.8% year-over-year in December. The Bank of Canada’s core index, which excludes eight of the most volatile components as well as the impact of indirect taxes, rose 1.6%. Core growth was bolstered by higher shelter costs, up 1.1% in 2016 – largely because of higher water and electricity bills. Homeowner costs were also up because of appreciation in real estate values. The index for homeowners replacement was up 4.3% annually in December but the rent index was only up 0.6% for the month. Rent costs have been growing consistently at this rate for 6 months. Clothing and footwear prices inched up a marginal 0.2% in December after posting an annual decline of 1.2% in November. The cost of health and personal care was reportedly 1.3% higher in December. Annual inflation was significantly higher in Newfoundland and Labrador compared to anywhere else in the country. Prices in that province reportedly climbed 4.1% over the year ending in December. This was due in part to higher taxes on gasoline and insurance premiums in that province. Annual inflation was also above the national average in New Brunswick, Ontario and British Columbia in December. 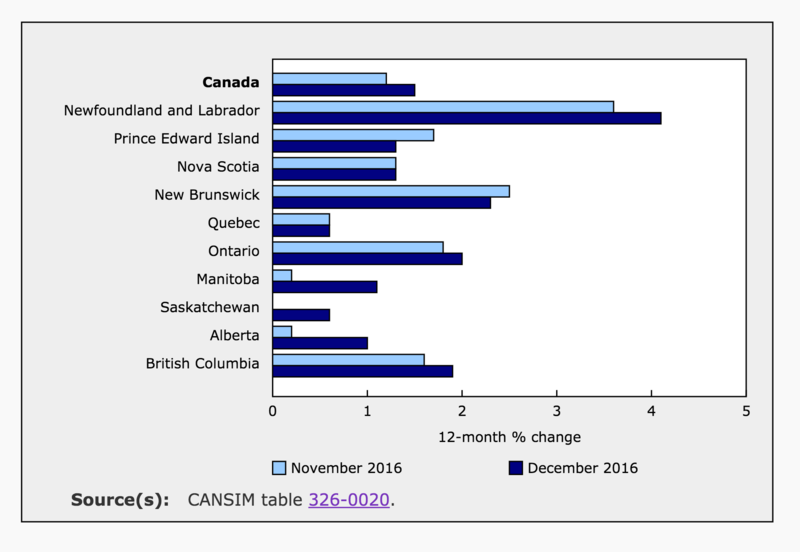 Meanwhile, PEI was was the only province where inflation slowed in December compared to November. 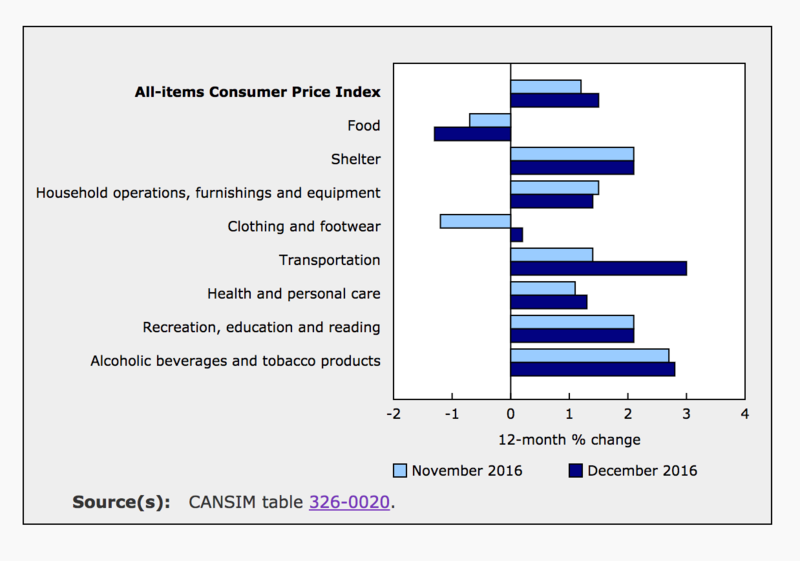 Inflation in Canada has been lower than anticipated since October, mainly because of declines in food prices. Measures of core inflation are below 2%, reflecting material excess capacity in the economy. As consumer energy prices rise and the impact of lower food prices dissipates, inflation is expected to move close to the 2% target in the months ahead and remain there throughout the projection horizon while excess capacity is being absorbed. The Bank also acknowledged the “significant uncertainty” surrounding their economic outlook. Major changes to trade agreements and international relations could have material impacts on prices and exchange rates. The Bank expects that Canada’s economy will grow at 2.1% in 2017 and 2018. They will announce the overnight rate again on March 1st and it is unlikely they will deem any changes to the overnight rate either viable or necessary.